Emma Hemness is Tampa Bay’s greatest legal treasure for those seeking elder law and estate planning advice. Although she is humble when you speak to her, you immediately realize there is a powerhouse of knowledge behind her easy demeanor. Emma is frequently recognized, consulted and acknowledged by her peers statewide as the leading authority in the field of Elder Law. We are pleased to announce that Attorney Emma Hemness is included in this year’s Top 100 Florida Lawyers from Super Lawyers. The Super Lawyers designation recognizes no more than 5% of all practicing attorneys in each state. Super Lawyers itself states “Super Lawyers selects attorneys using a rigorous, multiphase rating process. Peer nominations and evaluations are combined with third party research. Each candidate is evaluated on 12 indicators of peer recognition and professional achievement.” Out of more than 100,000 licensed attorneys in the state of Florida, Attorney Emma Hemness is in the Top 100 Lawyers! 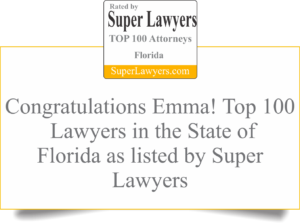 Different from AVVO, where Emma also holds the top-ranking score of 10/10, Super Lawyers is exclusively an instate peer endorsement. This means of all the lawyers you could choose to work with in the state of Florida – they have already selected Emma Hemness as their premier attorney in Florida. She is the only Elder Law Attorney to be included in this year’s Super Lawyers Top 100 Florida Lawyers from Super Lawyers. But Emma Hemness is no stranger to legal excellence. A past president of The Academy of Florida Elder Law Attorneys, the organization dedicated to attorney Elder Law excellence in Florida, Emma is a nationally recognized expert in her field. Her opinion on elder issues is sought by congressmen and women, national publications like the New York Times and elder-facing groups like the AARP. Emma discusses the issues so complicated her colleagues won’t touch them as easily as she discusses with her husband, Gerald Hemness, a seasoned probate litigator, where their next marathon should be. “We’re different. I know we’re different. We make the conscious choice to be there for our professional network when they need questions answered and to go the extra mile for our clients.” There is no attorney in Florida’s Elder Law Community who could ever be a better resource for you, your family and your business.